When it comes to your diet plan, there really are no shortcuts. You’ll have to watch your calorie intake and have disciplined eating habits combined with a steady workout program. The following are some excellent choices that can help you on your journey! Kale is the nutrient-packed juggernaut of all vegetables. It’s a powerful superfood that contains a load of vitamins and minerals, phytonutrients and fiber that give your body the nutrients to continue feeling good while cutting calories. Cabbage is a great food in assisting your diet plan due to its high fiber content. Try this vegetable in its fermented form as sauerkraut as well for some healthy probiotics! 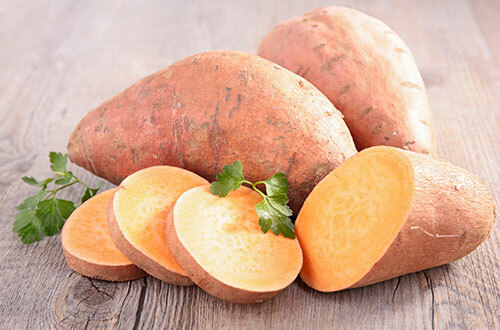 Sweet potatoes are a great source of starchy carbohydrate that is low glycemic. This means it breaks down slowly in the body giving you steady energy for hours. It also contains high amounts of dietary fiber, which helps you feel full throughout the day. Quinoa is a great part of a diet for similar reasons to the other foods on this list. It’s one of the highest protein-containing grains you can find and also has lots of dietary fiber. It’s also low on the glycemic index, so it digests slower, giving you a steady release of energy. Coconut oil is a healthy fat source that contains a type of fat called medium chain triglycerides (MCTs). This type of fat digests very quickly in the body, so it can easily be used for fuel, this can be especially beneficial when lowering carbohydrates and calories to keep energy levels up. 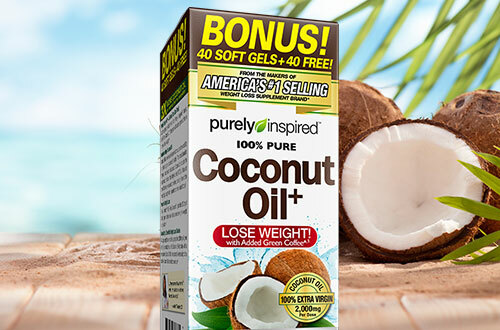 Try Purely Inspired® 100% Pure Extra Virgin Coconut Oil+ for this healthy fat in a convenient pill. Greek yogurt is a great addition to your program because it is very high in protein. It is important to keep your protein intake high in order to build and maintain lean muscle mass, which will in turn increase your resting metabolic rate, helping you burn more calories throughout the day. Try adding a few spoonfuls of Greek yogurt to your Organic Protein smoothies to help make them creamier and even higher in protein! Try adding these foods into your diet plan along with a good exercise program aimed at helping you burn calories. You can also supplement with a product like Purely Inspired® 100% Pure Garcinia Cambogia+ to help you along the way!